Places for 335 postgraduate students studying 28 different disciplines – including a number at Queen’s University – have been announced by the Arts and Humanities Research Council (AHRC). 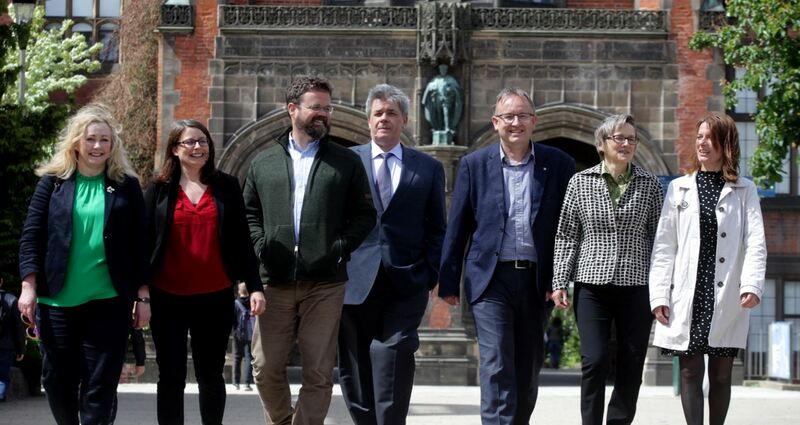 They will be based at one of the members of the Northern Bridge Consortium, which is made up of Durham, Newcastle, Northumbria, Sunderland and Teesside, along with Queen’s and UU. The postgraduate places, which will be made available over the next five years, mark a new era of collaboration between the alliance, which boasts world-class strengths across all Arts and Humanities disciplines, as well as meeting needs in areas of strategic priority such as Heritage and Design. The Consortium will offer students the highest possible quality of experience and support. The partners will work together to administer an annual competition for PhD scholarships and to deliver an innovative, world-class training programme for successful applicants. Talking about the importance of the award, Professor Crawford Gribben, Queen’s Northern Bridge Director and Professor of History from the School of History, Anthropology, Philosophy and Anthropology at the University, said: "This very significant award in support of PhD studies in the arts and humanities will combine the strengths of each of the universities in Northern Ireland and the north-east of England over the next five years. “It builds on the work of many colleagues and students in each institution, and shows how our local institutions can perform at the highest level." Robert Heslip, Heritage Officer at Belfast City Council, commented: “We’re looking forward to nominating doctoral topics and helping to engage some of our best minds in analysing the potential that developing our heritage assets holds for tourism and the wider economy here in Belfast. Northern Bridge will promote regional cohesion and development for the North East and Northern Ireland. As part of its commitment to collaborative working, it has developed strategic partnerships with regional, national and international cultural organisations, such as BALTIC Centre for Contemporary Art, Tyne and Wear Archives and Museums, and the British School at Rome. Professor Edward Harcourt, the AHRC’s Director of Research, Strategy and Innovation, said: “The AHRC is delighted to announce its renewed commitment to the Doctoral Training Partnerships model. Our support for the next generation of arts and humanities researchers is critical to securing the future of the UK arts and humanities sector, which accounts for nearly a third of all UK academic staff, is renowned the world over for its outstanding quality, and which plays a vital part in our higher education ecosystem as a whole. Crucially, the consortium will seek to award 20 per cent of studentships to Collaborative Doctoral projects, where the student works closely with an external partner. This builds upon its previous success in this area with partners such as Seven Stories: The National Centre for Children’s Books and Belfast City Council. Northern Bridge has also brought on board two Local Enterprise Partnerships in order to gain direct access to industry and other private-sector organisations. For media inquiries, contact Queen’s University Communications Office, +44 (0)28 9097 5845.